AIDS and the virus that causes it have challenged the world's scientists, health care systems, and public health policies as much or more than any medical problem in recorded history. Perhaps this is so because this particular infirmity constitutes more than a merely medical problem: it is enmeshed in psychological, social, cultural, political, and economic contexts. This book examines the need for pragmatic and research-based suggestions on how to address some important problems related to these contexts. Although much basic research in virology and immunology can be accomplished within the biomedical domain, biobehavioral disciplines such as behavioral medicine offer more opportunities for the comprehensive approach necessary to confront the AIDS/HIV problem. The editors of this groundbreaking volume suggest that the very nature of this constantly evolving problem encourages an approach to research and intervention/prevention efforts that emphasizes flexibility of response to changing knowledge, patterns of the pandemic, new treatments, and shifts in public opinion and behavior. A major triumph in dealing with this phenomenon would include a bridging of the gap between research and applied efforts, which has been the largest obstacle for progress to date. In this book, such previously uncharted territory is explored, opening a host of new possibilities for dealing with the very real threat of AIDS. Contents: A. Baum, L. Temoshok, Psychosocial Aspects of Acquired Immunodeficiency Syndrome. D.L. Rugg, M.F. Hovell, L.R. Franzini, Behavioral Science and Public Health Perspectives: Combining Paradigms for the Prevention and Control of AIDS. D.C. Des Jarlais, S.R. Friedman, Target Groups for Preventing AIDS Among Intravenous Drug Users. R.J. DiClemente, Adolescents and AIDS: Current Research, Prevention Strategies and Policy Implications. J.G. Joseph, S.B. Montgomery, D.C. Ostrow, J.P. Kirscht, R.C. Kessler, J. Phair, J. Chimel, Assessing the Costs and Benefits of an Increased Sense of Vulnerability to AIDS in a Cohort of Gay Men. L.J. Bauman, K. Siegel, Mispercepton Among Gay Men of the Risk for AIDS Associated With Their Sexual Behavior. T.J. Coates, R.D. Stall, C.C. Hoff, Changes in Sexual Behavior Among Gay and Bisexual Men Since the Beginning of the AIDS Epidemic. K. Straits, L. Temoshok, J. Zich, A Cross-Cultural Comparison of Psychosocial Responses to Having AIDS and Related Conditions in London and San Francisco. P.G. Bourne, The Behavioral Aspects of AIDS: An International Perspective. S. Namir, D.L. Wolcott, F.I. Fawzy, M.J. Alumbaugh, Implications of Different Strategies for Coping with AIDS. J.M. Moulton, D.M. Sweet, L. Temoshok, Understanding Attributions and Health Behavior Changes in AIDS and ARC: Implications and Interventions. J. Zich, L. Temoshok, Perceptions of Social Support, Distress and Hopelessness in Men With AIDS and ARC: Clinical Implications. S. Tross, Neuropsychological Impairment in AIDS. G.F. Solomon, L. Temoshok, A Psychoneuroimmunologic Perspective on AIDS Research: Questions, Preliminary Findings, and Suggestions. A. LaPerriere, N. Schneiderman, M.H. Antoni, M.A. Fletcher, Aerobic Exercise Training and Psychoneuroimmunology in AIDS Research. L. O'Donnell, C.R. O'Donnell, J.H. Pleck, J. Snarey, R.M. Rose, Psychosocial Responses of Hospital Workers to AIDS. D. Miller, The Worried Well: Phenomenology, Predictors of Psychological Vulnerability, and Suggestions for Management. "...an important contribution to our understanding of the complex biopsychosocial and sexual aspects of human immunodeficiency virus and its related symptoms and diseases." "The complexity of preventing and treating HIV disease requires a biopsychosocial perspective based on collaboration among investigators, practitioners, program designers and evaluators, policy makers and consumers. This volume is a solid step toward building such an effort." 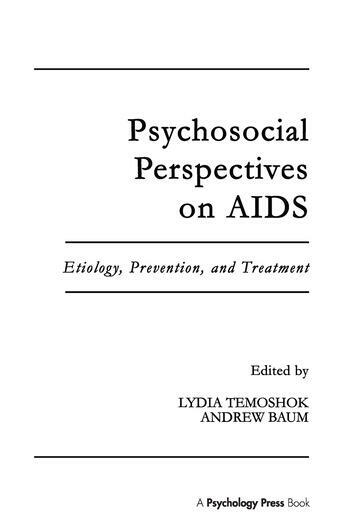 "...a good compilation of the existing literature on the psychosocial aspects of AIDS. Appropriate for undergraduate and graduate collections."